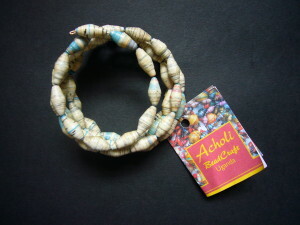 Made from rolled, recycled paper beads by a womens group in Uganda who make this jewellery to supplement their income from working in the quarries, in order that they might educate their children. The bracelet/bangle is beaded onto soft wire to wind around the wrist in a spiral. Please note that there is a necklace and earrings to match, if required - available to purchase separately on this website.